Editorial in this morning's St Augustine Record dealing with the King's Grant development request. Good to see the Record seems to understand that a developer has no 'right" to a Planned Unit Development (PUD) and that it is not local government's duty to maximize a developer's profits. 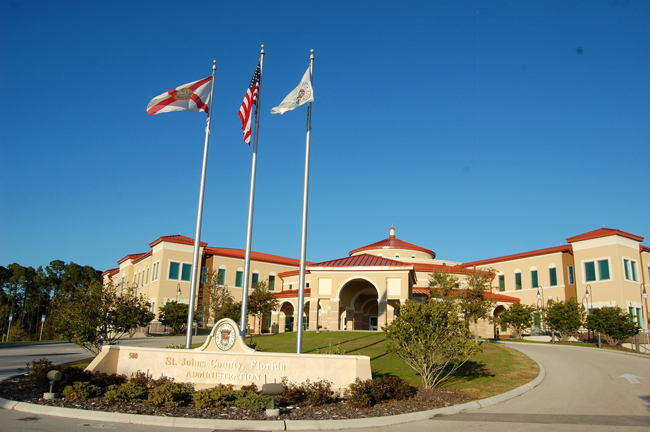 Are you listening City of St Augustine commissioners? "RECORD EDITORIAL: King’s Grant: Will we stand and fight or duck and run? So when we say that Tuesday’s County Commission meeting will be seminal, two meanings fit the bill. At noon, County Attorney Patrick McCormack will call a special, closed-door meeting between the county and the development team of King’s Grant, a contentious development planned for County Road 206, near I-95. Short story, the developer is suing the county because it did not give King’s Grant what it wanted in terms of land-use exceptions/exemptions. The fight is four years old. In 2016, County Commissioners, in another seminal moment, turned down King’s Grant’s request to expand the parameters of its existing land-use. It was especially noteworthy because it heralded a break in our County Commission’s familiar role as patrons of the art of development. In short, we stood up to the developer. It’s important to know, too, that the county did not do it alone. The poster child for civic engagement in our county is SACA, the South Anastasia Communities Association. The group sought to legally join the county in defending the suit. The developer immediately sought to cull SACA out of the fray, arguing before a judge that the residents are adequately represented by their government in land-use issues. Yes, we grinned, too. Circuit Court Judge Robert Rouse grasped the Jeffersonian aspect of the issue and ordered that, yes, those people most directly involved in the eventual outcome of the suit had the right to join in the defense of their neighborhoods and quality of life. The developer’s suit seeks “declaratory and injunctive relief” from harm caused by the county’s denial of a requested Planned Unit Development. The comprehensive plan, it says, targets that land for residential and commercial growth. But nowhere does a comp plan convey rights to a builder outside the parameters of existing land use codes — defined or implied. And a comp plan is guideline, not a mandate. The important point to understand in this extended fight is the developer can break ground tomorrow and begin to build King’s Grant with every developmental right it currently has under existing land use and zoning laws. What does King’s Grant want? The moon. In 2014, it originally came to the county with plans for 925 homes and 100,000 square feet of commercial on 593 acres. After being twice turned down by the County Planning and Zoning Agency, it appealed the decision to the County Commission, but this time, demanded more density than before — now seeking to build 999 homes on 40-foot lots at $300,000-plus each. And now, the plan included 130,000 square feet of commercial, 200 motel rooms, a 120-bed rehab hospital, a 260-bed assisted living facility and 80,000 square feet of professional/medical office space in a later phase of development. Talk about spontaneous combustion of land-use parameters. More power to it for asking. But in no scenario of law or lust, does the county have any responsibility to guarantee maximum profits to a developer who bought the land eyes wide open. It knew precisely the size and scope of land-use and zoning laws allowed there. That’s why it is “asking” for a PUD to fill its profitability wish list, rather than “telling” us. Does that not demonstrate the basic legal limit of “rights”? This closed meeting Tuesday will be a bellwether moment for us all. The county and SACA have a strong case. Despite all the legal bravado, the developer wouldn’t be seeking a back door of compromise if it didn’t fear the front door of open litigation. What the county does with this issue will most certainly become a bellwether.